Whitstable: Whitstable is a damned lovely seaside town, the sort of place Margate is aspiring to, and that Southend will never be. It doesn't have a pier or amusement arcades, but it does have oysters and a rather tasteful shopping street. I nipped through to the seafront at the Horsebridge (which is the town's 10 year-old arts centre, currently exhibiting some fine Graham Clarkes, and preparing for the Whitstable Biennale next weekend) to start my coastal hike. The first stretch, from the pile of discarded bivalve molluscs to the harbour, was busy with first-time tourists and umpteenth-time stalwarts. Fish and shellfish are the order of the day, here purchasable and sampleable and takehomeable and most definitely smellable. Throw in a bijou weekend market by the quayside and you can see why people don't leave. I left, heading out onto the promenade to start the long trek east. The path is long and mostly straight, very straight in places, past a selection of oversized beach huts and a shallow sea wall. The beach hereabouts is piled-up pebbles broken by wooden groynes, indeed will be for several miles beyond. Inland to start with are low vegetated slopes, the first (at Tankerton) home to the exceptionally-rare hogs fennel. The sailing club is busy, it being dead simple to drag one's sailing boat down a short ramp into the water and into the inner bay. Cyclists must retreat inland at the mouth of the Swalecliffe Brook, a extra-sinuous stream that finally enters the sea behind a short shingle bank. And then it's back to relentless concrete boardwalk, past dog walkers and cyclists and a conveniently situated campsite. Ahead, jutting out into the bay on a low headland, is what looks at first like a dappled Mediterranean village. Alas no such luck, as closer inspection reveals a bank of bungalows and semis - the first suburban vanguard of Herne Bay. Herne Bay: Herne Bay tries hard, but can't quite hit the heights of damned loveliness that Whitstable achieves. It came to prominence in the second half of the 19th century, a resort built up on steamer traffic from London and the obligatory railway connection, still somewhat genteel but with a more common underbelly. The town's main landmark is the world's first free-standing clocktower, donated by a local lady in 1837 when this was just a fishing village. A group of bikers have parked up alongside for the bank holiday, in an entirely unthreatening way, while overfed kids wander by with bags of chips in their hand. Hidden down a sidestreet is Herne Bay Museum and Gallery, a two-storey shop unit packed with reminiscence and memorabilia from the glory days. It's very much a two-pounds-worth kind of attraction, and definitely worth a look, not least for the giant prehistoric elephant's tusks picked off the foreshore at a particularly low tide last year. Herne Bay's pier has an illustrious, but fast diminishing history. Once the second longest in the country, with an elevated electric tramway along its length, now only a stump remains... plus the pierhead standing alone way out to sea. On my last visit a sports pavilion sat above the water, but now even that's been removed to leave a wooden platform, a mini-market and (at time of writing) a lone helter skelter. A longer-standing attraction is the Telly-Go-Round on the promenade, an automated cart operated by the town's Rotary Club. Stick a coin into the slot and one of a selection of dated children's TV characters appears briefly from behind a screen, or hit the jackpot and every window opens simultaneously. Quite what today's toddlers are supposed to make of Count Duckula, the Teletubbies and a trainful of Magic Roundabout characters chugging by I'm not sure, but they throw their money in all the same. Another blast from the past is the Famous Faces mural on the wall of Cains Amusements, featuring such well known residents as John Altman from EastEnders, Nicki Chapman from Pop Idol and Bob Holness from Blockbusters. Points will be awarded if you can recognise anyone. Meanwhile families you'd never find in Whitstable can be found propping up the machines inside the arcade, while their older relatives enjoy a tea or cake at one of the cafes inside the rather luxurious bandstand. On a Sunday it's the only place to hear Dream A Little Dream Of Me, as interpreted by some local crooner to a part-attentive audience. Further down the town is the guano-splattered statue of Sir Barnes Wallace, who tested the bouncing bomb just offshore, where now the jetskiers speed and circle. 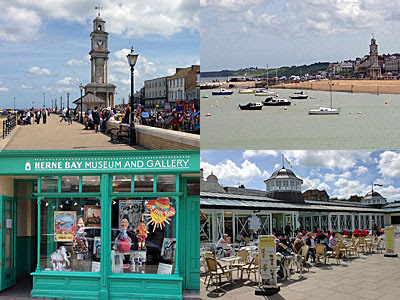 To make sure you don't miss a thing on your visit, be sure to follow the Herne Bay Cultural Trail around the town. The Oyster Bay Trail runs onward at beach level, arrow straight along a succession of shingly breakwaters, so the next mile is a bit of a slog. But all that changes with a step up to the top of the sandstone cliffs, here so crumbly that a succession of warning notices have had to be erected to warn the curious away from the edge. Watch out for the sand martins which nest below soaring and swooping over your head. The trail rounds a ravine, and passes some tenuous bungalows, before emerging trough a thicket onto a glorious sweep of grassland. Reculver Country Park rolls gently down towards two towers in the distance, the meadow currently a riot of late spring colour. From up here you can look west to Sheppey and east to Margate, as well as north to the Kentish Wind Farm which has been our constant companion along the journey. In good visibility yes, that's Southend on the far shore, and those tiny specks are the turrets of the Maunsell Forts at the mouth of the Thames estuary. Reculver: Reculver used to be a most important spot, perched on the last clifftop in Kent before the sea and the Isle of Thanet. The Romans built a large fort here, then the Anglo Saxons a church, of which now only two tall towers remain. These were retained in the 19th century when the rest was demolished, or tumbled over the edge, because they provided a failsafe navigational aid for sailors. They're still visible for miles around, for example from way back in Herne Bay, perched somewhat precariously on a protected headland. The village today is essentially a caravan park, plus pub, plus visitor interpretation centre, providing information and a trio of refreshment opportunities. But the real reason you'd walk/cycle this far is to ascend the slight hill and stand within the old church beneath the twin towers. Here you can admire the old stonework, or clamber over what used to be the chancel, or simply sit and have a picnic amid the ruins. And then, deep breath, the nearest stations at Herne Bay or Birchington are four miles distant, so best get going.